The Kansas-Nebraska Act was passed by the U.S. Congress on May 30, 1854. It allowed people in the territories of Kansas and Nebraska to decide for themselves whether or not to allow slavery within their borders. The Act served to repeal the Missouri Compromise of 1820 which prohibited slavery north of latitude 36°30´. The Kansas-Nebraska Act infuriated many in the North who considered the Missouri Compromise to be a long-standing binding agreement. In the pro-slavery South it was strongly supported. After the Kansas-Nebraska Act was passed, pro-slavery and anti-slavery supporters rushed in to settle Kansas to affect the outcome of the first election held there after the law went into effect. Pro-slavery settlers carried the election but were charged with fraud by anti-slavery settlers, and the results were not accepted by them. The anti-slavery settlers held another election, however pro-slavery settlers refused to vote. This resulted in the establishment of two opposing legislatures within the Kansas territory. 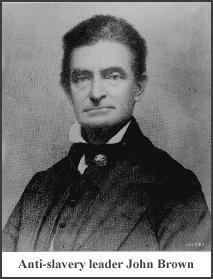 Violence soon erupted, with the anti-slavery forces led by John Brown. The territory earned the nickname "bleeding Kansas" as the death toll rose. President Franklin Pierce, in support of the pro-slavery settlers, sent in Federal troops to stop the violence and disperse the anti-slavery legislature. Another election was called. Once again pro-slavery supporters won and once again they were charged with election fraud. As a result, Congress did not recognize the constitution adopted by the pro-slavery settlers and Kansas was not allowed to become a state. Eventually, however, anti-slavery settlers outnumbered pro-slavery settlers and a new constitution was drawn up. On January 29, 1861, just before the start of the Civil War, Kansas was admitted to the Union as a free state.